USB Mode: Plug in the USB stick, the music in the USB stick will play automatically and you can use the remote controller to control it. 2 Speakers 2.0 Channel Bluetooth Sound Bar ~ Not only are there 2 x 25 Watts Speakers and digital amplifier but also with DSP built inside. 2.0 channel Home Theatre Sound System can provide you a loud and clear surround audio experience in the bedroom and living room. Dual Ways of Connection ~ Not ont wired connection with AUX\Optical\USB input modes, stream your music wirelessly with powerful built-in bluetooth. User Friendly ~ Infrared remote control displays different modes through different colored LED lights. 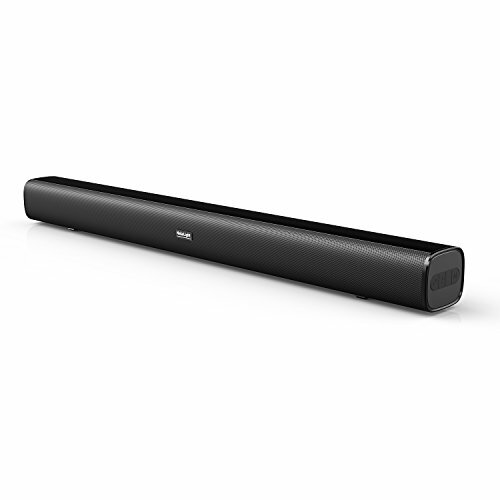 Unique Design Soundbar ~ Our sound bar has unique 29.5-Inch smooth appearance design, Rubber Antiskid for safety stand, LED indicator light and sensitive button. Much easier for users to operate. Outstanding Sound System ~ It's an excellent sound bar to improve your TV sound. Give you a better sound quality for watching movies, listening music and playing video games.